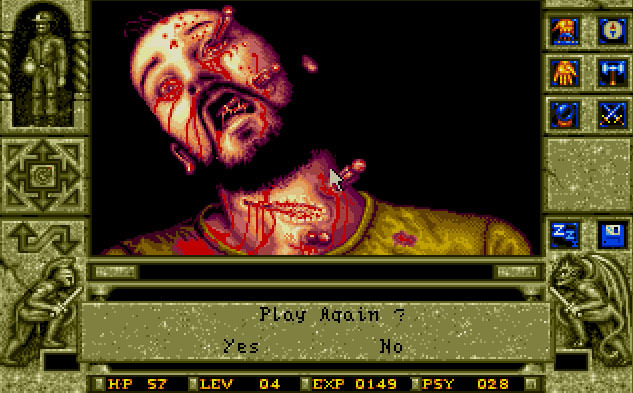 I'm not kidding about the NWS thing - there are some pretty gruesome scenes in this game. It's a fairly old game - particularly telling is the fact that you can only move in 90 degree increments - but it's still pretty damn creepy. After the disappearance of our main character's twin brother, and the death of his Uncle Boris, we've been bequeathed the late Boris's own Waxworks. Which would be pretty cool, but this creepy looking guy is apparently part of the deal. I guess the first thing we should do is buy him a suit that actually fits. 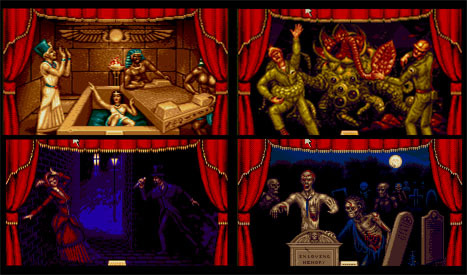 Then we can get the Waxworks up and running, perhaps turn a nice profit and.. Uh oh. Looks the whole 'Waxworks Management Sim' deal is out of the window. 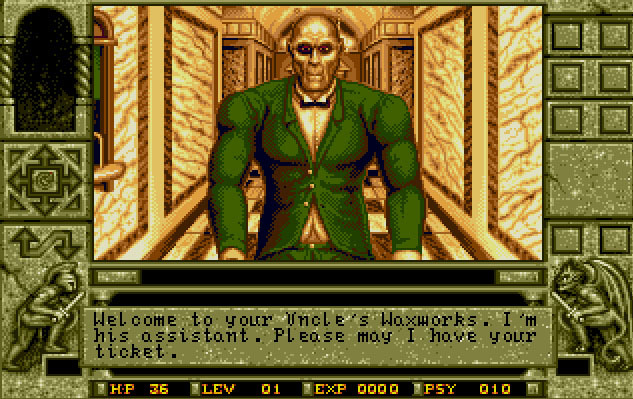 Our late Uncle Boris appears to us in Wonky Spiritvision(TM) to offer us a quest. 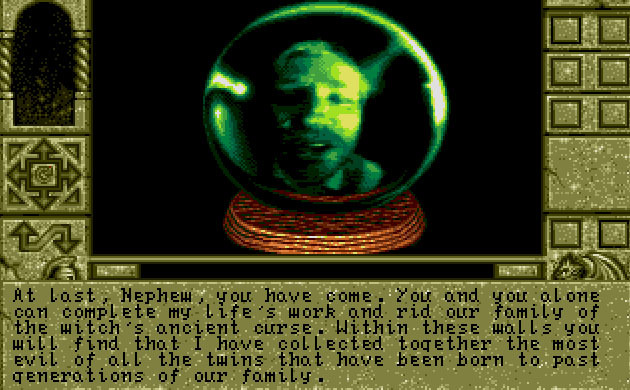 Apparently smashing his crystal ball and getting the hell out of there isn't an option. Not least since someone - or something - has locked the door. It turns out that, long ago, a witch cursed our character's family, making every twin brother evil. The only way to lift the curse is to enter each Waxwork and dispatch the evil twin brother hiding in each. Piece of cake, right? I mean, what's the worse that can happen? Well, stuff like this, for a start. So, I leave it to you, goons. Which waxwork should we enter first? Ancient Egypt, Old London - complete with Jack the Rippper, The Infected Mine, or The Zombie Graveyard? Wow, looks like no time's been wasted jumping into the fray. Does the game really start you off so abruptly, or is there more backstory to it? Anyway, I vote London, simply because of Jack the Ripper. So how's the game actually play? I notice a lot of extra readouts at the bottom, such as XP, PSY, and all that jazz. It does throw you in that quickly. Once you've had the crystal ball scene, you have to pick one of the four waxworks. It plays like an action RPG. You can level up, but you don't get to choose what skills get improved, the game does it for you. There's a bit of fighting and a big of puzzle solving, but the screens are largely static, with a bit of enemy animation. It's more like Captive than Doom.